New motorway service area signs which will enable motorists to make more informed choices about where to take their breaks have been given the go-ahead by Roads Minister Mike Penning. But nothing is beiong done to stop motorway service areas from 'fining' drivers who fall asleep and overstay 2 hours in motorway service areas. Service areas will now be able to display up to six logos indicating the facilities and franchises operating at each site. Currently only generic symbols - such as a knife and fork - are allowed. Surveys of motorists previously undertaken have indicated that a particular value is placed on information that tells them where they are. Having taken on board this feedback, there will now also be a requirement for operators to include geographical information on the new signs situated a mile and then again at half mile before a services. "By encouraging drivers to take regular breaks, motorway service areas make a vital contribution to road safety and it is common-sense that motorway users should have as much information as possible about the choices available at service areas. "The system I inherited just wasn't fit for purpose for either road users or the operator. To get brand names on signs, some operators even went as far as re-naming their company to reflect the main franchise operating on their sites because there was no flexibility in the rules. "Now, they will no longer need to do this. The more descriptive signs will encourage drivers to take regular breaks, increase healthy competition and contribute towards service areas improving the services they provide to road users. " Operators will be invited to submit applications with a view to the first signs being installed later this year. As now, the cost of installing these signs will be met fully by the motorway service area operators. 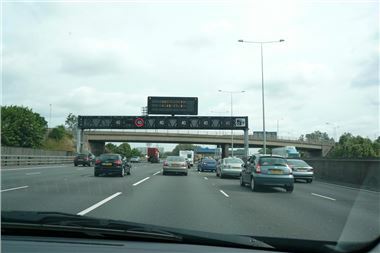 The change is being made as part of the Government's wider review of traffic signs. Thias clearly states: "Remember, the only real cure for sleepiness is proper sleep. A caffeine drink or a nap is a short-term solution that will only allow you to keep driving for a short time." So HJUK questions why motorway service opwerators are being allowed to peanalise drivers who stop at a motorway service area and fall asleep for more than two hours.